You might’ve noticed that we have a thing for paper flowers around here. 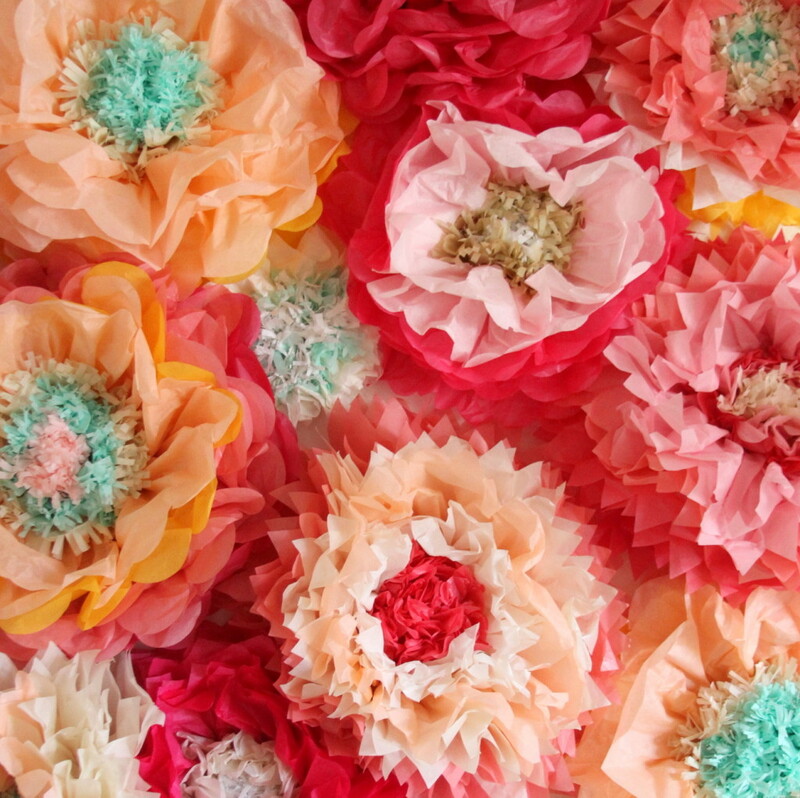 In fact, I pretty much have been in love with crepe paper flowers since I first saw them in Martha Stewart Weddings magazine ages ago. 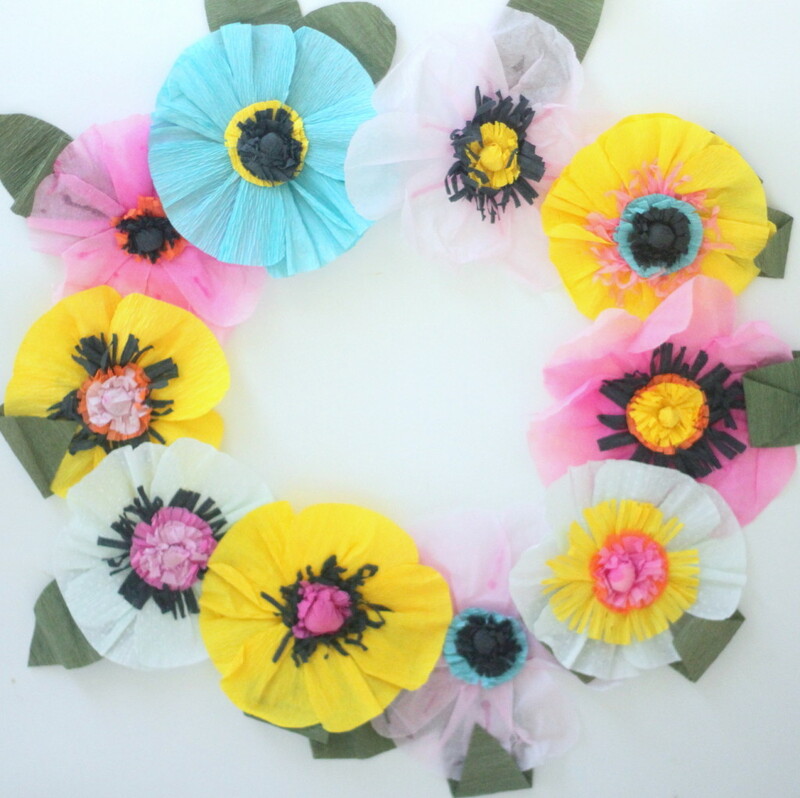 And paper flowers are often the perfect addition party decor (or even kids’ room decor!). The thing is, they are just so labor intensive. SO gorgeous, but they just take so long to make! With April next on the calendar (what!?! How did this happen!?! ), an empty morning on my hands, a couple of rolls of crepe paper, and my affinity for paper flowers, I thought I’d try to figure out how to streamline the paper flower making process. And, friends, I think I’ve done it! 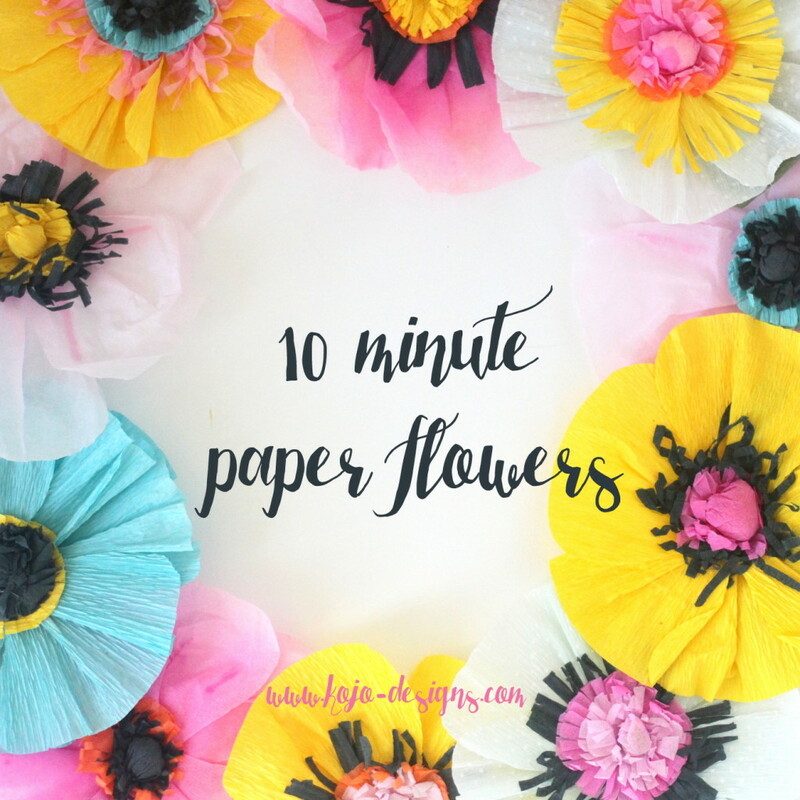 These paper flowers (the most simple ones) take about 10 minutes to put together, less if you make a little assembly line. First, cut one strip of 4″ wide crepe paper (the wide roll European kind, not the streamer kind). Fold into sixths. Cut six petals (either make a quick template or just eyeball it). 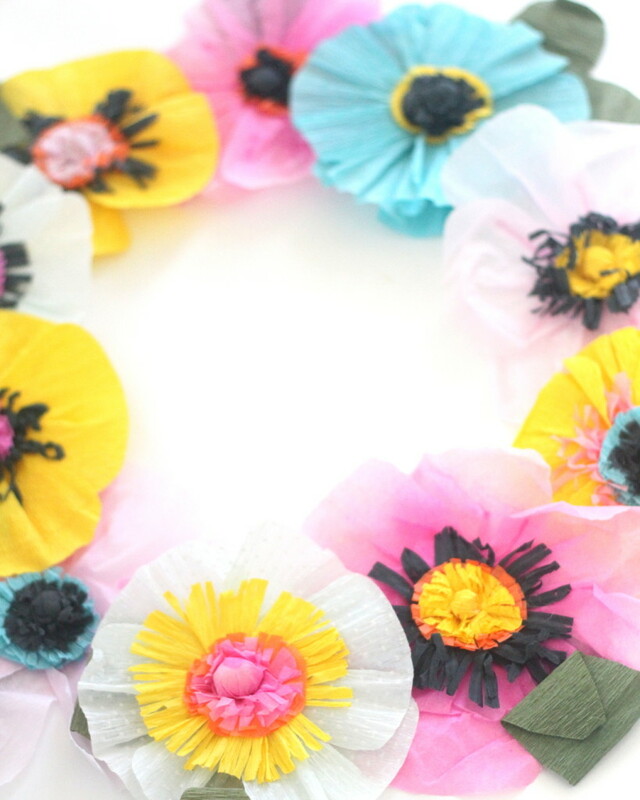 Then cut out two circles- a 1.5″ circle (the same color as the wrapped pom pom) and a 2″ circle. Fringe the edges of both. Also, wrap a pom pom in tissue and secure the opening with hot glue. Cut out two or three crepe paper leaves. Stack all of those elements- first glue the two fringed circles (smaller on top of larger). Then glue the tissue covered pom pom in the center of those circles. Then glue the petals, one at a time, to the back of that ‘center.’ In order to make the petals have more shape, pull the top edge out to stretch it and pleat the bottom edge. Then glue in place. Add the leaves at the end. Done! 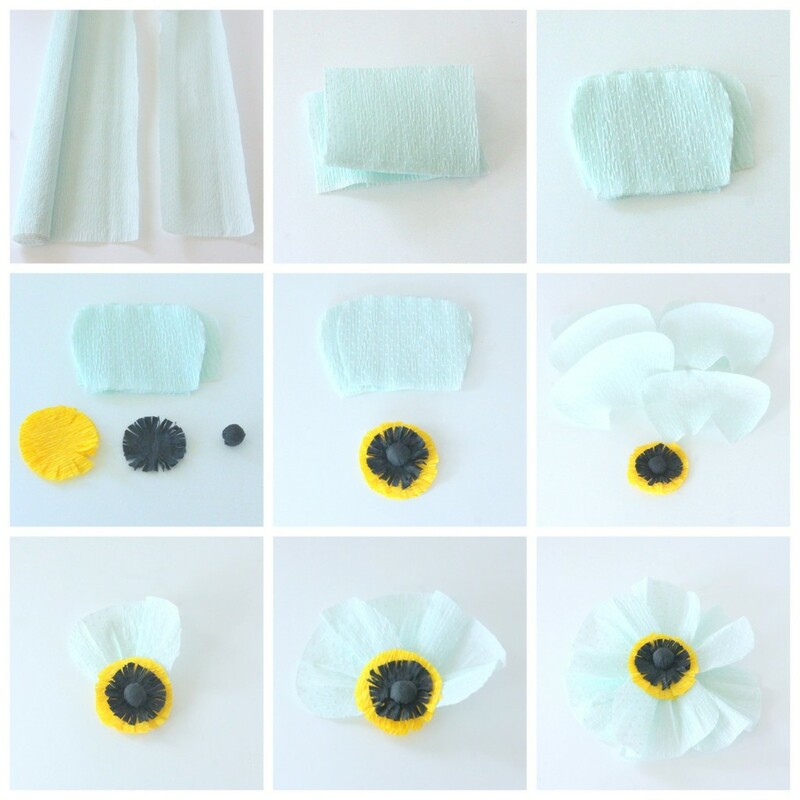 Simple paper flowers put together in 10 minutes! ps- We have put together not one, but two, entire walls of paper flowers with the much more labor intensive paper flowers. For those directions- check here and here. These are gorgeous!! I’m so glad you contacted me. Love your site! !